Definition at line 1902 of file lscript_tree.h. Definition at line 1905 of file lscript_tree.h. Definition at line 1910 of file lscript_tree.h. Definition at line 7757 of file lscript_tree.cpp. 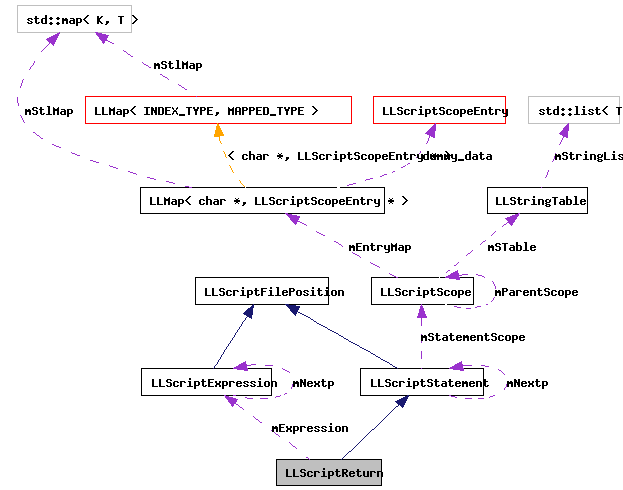 Definition at line 7762 of file lscript_tree.cpp. References add_return(), LLScriptByteCodeChunk::addByte(), LLScriptByteCodeChunk::addInteger(), LLScriptFilePosition::fdotabs(), gErrorToText, LLScriptGenerateErrorText::getErrors(), LLScriptStatement::gonext(), legal_assignment(), LOPC_LOADLP, LOPC_LOADP, LOPC_LOADQP, LOPC_LOADSP, LOPC_LOADVP, LSCP_EMIT_ASSEMBLY, LSCP_EMIT_BYTE_CODE, LSCP_EMIT_CIL_ASSEMBLY, LSCP_PRETTY_PRINT, LSCP_PRUNE, LSCP_TO_STACK, LSCP_TYPE, LSCRIPTOpCodes, LSCRIPTTypeReturn, LSERROR_INVALID_RETURN, LSERROR_INVALID_VOID_RETURN, LSERROR_TYPE_MISMATCH, LSPRUNE_EVENTS, LSPRUNE_GLOBAL_NON_VOIDS, LSPRUNE_GLOBAL_VOIDS, LST_FLOATINGPOINT, LST_INTEGER, LST_KEY, LST_LIST, LST_QUATERNION, LST_STRING, LST_VECTOR, mExpression, mType, NULL, print_return(), TRUE, and LLScriptGenerateErrorText::writeError(). Definition at line 1917 of file lscript_tree.h. Definition at line 1918 of file lscript_tree.h.